"Executive Committee of Pennsylvania Anti-Slavery Society"
click image for close-up During the 1830s, 40s, and 50s, antislavery societies sprang up in cities across the North. In 1837, Philadelphia was home to three such organizations: the Philadelphia Female Anti-Slavery Society, the Philadelphia Young Men's Anti-Slavery Society, and the Philadelphia Anti-Slavery Society. Philadephians were also involved with the Pennsylvania Anti-Slavery Society, whose executive committee is pictured here, in 1851. 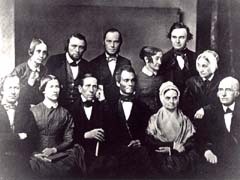 Standing, from left to right, are Mary Grew, E. M. Davis, Haworth Wetherald, Abby Kimber, J. Miller McKim, and Sarah Pugh; seated are Oliver Johnson, Mrs. Margaret James Burleigh, Benjamin C. Bacon, Robert Purvis, Lucretia Mott, and James Mott.